Wouldn’t it be wonderful, if beer was actually really healthy? Instead of damaging your liver and giving you hangovers? Oddly, in the 19th century beer was seen as a perfectly healthy drink. This was of course an age when many people drank themselves half-conscious with gin, and then beer didn’t look so bad. Certain types of beer were even exclusively marketed because of their healing qualities. The Jopen beer of Danzig for instance, a dark, syrup-like substance that was supposed to be ‘very wholesome for glandular conditions’ and it also worked against ‘stomachache and shortness of breath’. The Dutch Van Vollenhoven brewery in Amsterdam from 1880 onwards had its Extra Stout, the ‘most reinforcing drink for the recuperating, anemics, and women in childbed’ (and we’ll be getting back to that). 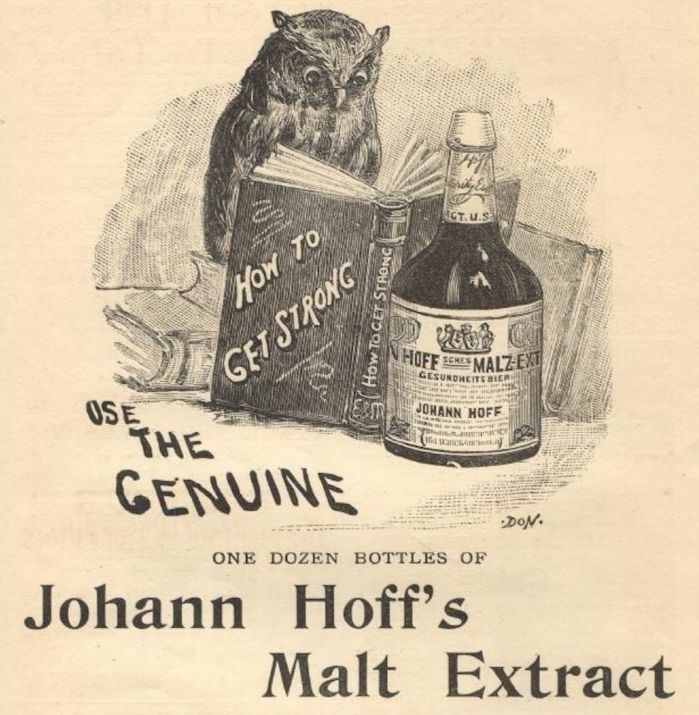 But the apex of healthiness must have been the Malt Extract or ‘Health beer’ (Dutch: Gezondheidsbier) made by Johann Hoff in Berlin. 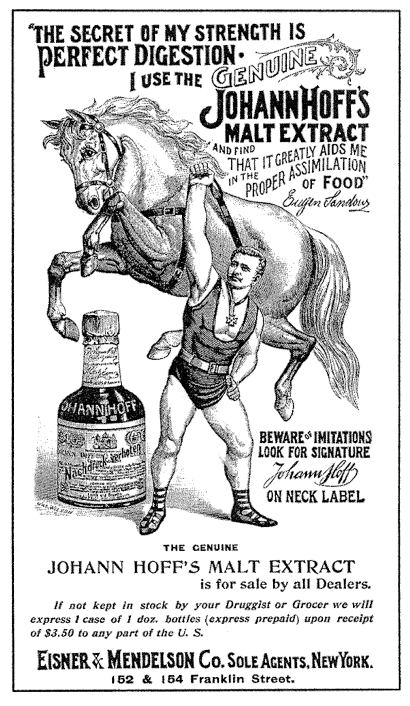 In 1862 Hoff advertised its ‘favourable effect’ in the Netherlands (Holland) for the first time. He did so by quoting a letter from a certain Ms. J. Kuypers of Epe, who wrote that her sister ‘felt already slightly better after using 6 bottles’. For decades, this remained Hoff’s marketing strategy: quoting letters written by grateful cured drinkers who had regained their powers thanks to the Health beer. From the noble princess Ernestine zu Löwenstein-Wertheim-Freudenberg to the simple labourer Teunis Klein from Sliedrecht, they were all very thankful and requested more bottles. What is more, the doctors of medicine and personal physicians were fighting for an opportunity to praise Hoff’s health beer, or so it seemed. 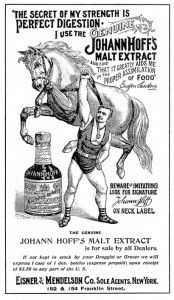 But then again, these were the times that newspapers were full of advertisements of dubious miracle cures like ‘Rhenish grape breast honey’ (no kidding), ‘Haarlem oil’ and ‘Swiss pills’, the exact functioning of which was always kept vague. Hoff’s success in Holland was even imitated by one E. van der Maaten in the small town of Elburg, who came up with a ‘Power beer’ which was an ‘excellent medicine… against all illnesses or appearance thereof’. No wonder that the Dutch Society against Quacks, founded in 1881, was kept quite busy by this phenomenon. The question remains: what sort of liquid was this Health beer by Johann Hoff? 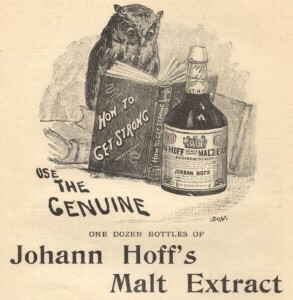 Not surprisingly, the recipe of this ‘Malt Extract’ was supposed to be a well-kept secret. However, already in 1861, the year before it reached the Dutch market, the German periodical Pharmaceutische Centralhalle researched the beer. The outcome? It was an ordinary brown beer, in which the makers had dissolved some laxative(! ), buckthorn bark (as a colorant) and so-called water clover (as a bittering agent). The researchers calculated that the cost of producing it came at 9 cents, while Hoff sold it at five times as much. For those who fancy a nice pint of Health beer, this is the recipe as Pharmaceutische Centralhalle determined it: 6 parts buckthorn bark (ramnum frangula), 1 part clover (trifolium fibrinum), 60 parts brown beer, let it soak for one day, and after cooling and filtering mix it with an additional 300 parts of beer. Cheers! Leydse courant 12 December 1864. Leidsch Dagblad, 6 March 1901. Algemeen Handelsblad 18 November 1862. Dagblad van Zuidholland en ‘s Gravenhage 20 April 1866. As quoted in the Nieuw Amsterdamsch handels- en effectenblad 10 December 1861. This article was based on an earlier version in Dutch, http://verlorenbieren.nl/verloren-bieren-9-gezondheidsbier/.